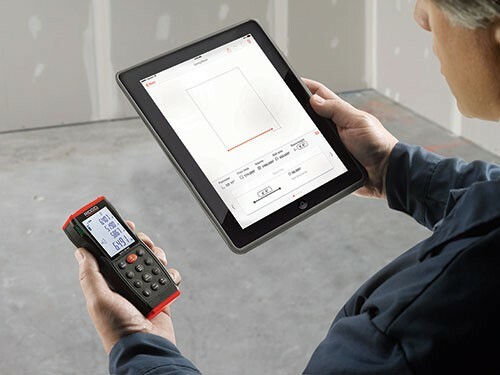 Ridgid has announced that they are coming out with a new LM-400 Advanced Laser Measurer that uses Bluetooth technology to transmit measurements directly your smartphone or tablet. Using their free app you can add the measurements directly to a photo or create a floor plan. The Ridgid LM-400 has a measuring range of up to 229 feet (70m) ± 1/16-inch and can display the measurements as inches, feet, or meters. It features a four-line backlit display that is easy to read on poorly lit jobsites. In addition to being able to see the last three measurements on the multi-line display, you can also recall up to 20 past measurements. 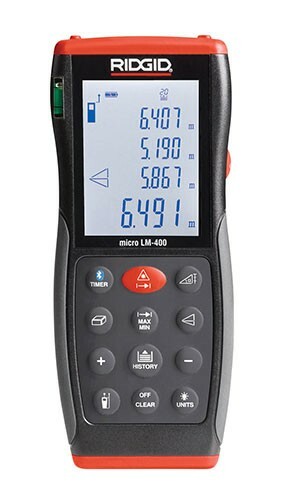 The LM-400 is advanced not only because of the Bluetooth connectivity, but also because of its built-in inclination angle measurement system that allows it to do indirect measurements in places that might be impossible to measure otherwise. If a laser measurer with Bluetooth sounds familiar it is because Bosch has come out with a similar Laser measurer (the GLM 100 C) that shares many of the same features. Unlike the Bosch GLM 100 C, it doesn't look like the Ridgid LM-400 can be remotely controlled with a smartphone, and there doesn't seem to be a way to upload measurements directly to a computer. Bosch's version also uses a rechargeable battery while the LM-400 runs on two AA batteries. I don't have a price yet on the Ridgid LM-400, but if it is cheaper than Bosch's $300 GLM 100 C, I think it could be a real winner. It is lacking some of the features that Bosch has, so I would hope that it is not priced the same. Update: Some online stores have the LM-400 listed at just under $200, which seems like a very reasonable price.